Hey guys, it´s me Gordman! Recently, I had the great opportunity to play one of the most wanted games for Master System collectors: Les Schtroumpfs Autour Du Monde, also known as Smurfs 2 or Smurfs Travel The World. I was wondering that no one reviewed this very nice title yet. I needed only a few days to finish this game, but I can tell you that it´s worth playing! Read on.. In Les Schtroumpfs Autour Du Monde, you need to collect a specific number of crystals every level. Most of them are easy to find, but for the others, you have to kick the opponents a** :D Jump on the opponents and beat them. Some of them losing the crystals you need to finish a level. 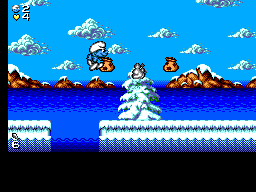 Your Smurf can also do a kick, but I prefer to jump on the bad guys. There are no weapons like stones for throwing or something, but you don´t need that. The opponents are easy to beat most of the time. Some of them are a little tricky, like the scorpions or the seals. You can only jump on their heads to beat them, otherwise you receive a strike! You can collect hearts to fill up your lives and some things of trash to get points. You can play as a normal Smurf or Smurfette - It´s nice. A great thing is that every single level has a new design and new opponents (which are looking cool, girls would say cute). It looks great all around. 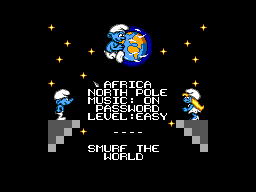 Your Smurf has to travel around the continents of the earth (like the title says). Every continent has three total different levels. This is great cause the game will never be boring. You can collect hearts to fill up your lives and some trash to get points. Smurfs 2 has two parts of difficulty: Easy and hard. I played hard, but it´s also easy, except for a few later levels. Overall, this game is great, especially for kids. It´s absolutely non-violent and I like it. Ok, Smurfs are never violent, but other SMS games are. So Smurfs 2 is one of the harmless games on the SMS. Sadly there are no end bosses. But Smurfs 2 is so various with the levels that I didn´t missed end bosses.. And last but not least, it has a password option with only 4 letters. I think I have nothing forgotten, so let´s go to the graphics! They are pretty good. As I saw the first level, I was a little disappointed. The background looks rainy, but isn´t animated. Such nice graphics and no animated backgrounds? I was surprised with the later levels, there a absolutely great animated backgrounds sometimes. One of my personal highlights is the level with the big waterfall, which remembers me on the Jungle Zone in Sonic 1. Level one in the last world is also be nice. It´s a village in the trees with dragons (They look like dragons^^). The opponents and the Smurfs look great too. To be honest, I have nothing bad to say about the graphics. Infogrames did a great job here. There are three different musics in the levels. They repeat after you finished a continent. But they don´t get on the nerves, quite the contrary: The music is good and is nice to your ears^^ But one or two more musics were not bad. The jingles are ok too, nothing special to say about it. One button for jumping, one button for kicking. The controls are fine to me. Your control over the Smurf when he jumps is good without physical curiosities. 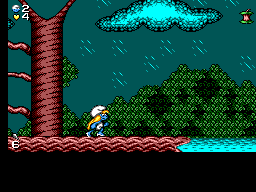 I lost a few lives cause I was impatient and want to finish the levels - No mistake by the game :D He doesn´t need to run, he´s fast enough when he walks. Climbing is ok, only the swimming is a little complicated when a fish wants to touch you. You can´t speed up the Smurf and sometimes the fishes can hit you in small water caves. But this is the only minus point I have with the controls. Sadly, if it´s finished one time, it´s over for a few years cause the difficulty is easy, even if you play it on hard level. The nice levels makes it worth to give it another chance one time.